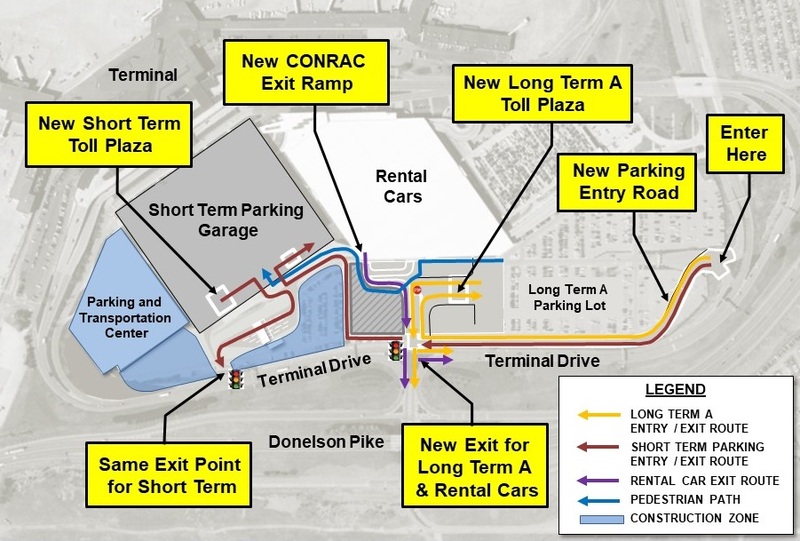 NASHVILLE – Nashville International Airport (BNA) is advising travelers of changes to the Long Term A parking lot, Short Term Parking Garage and the Consolidated Rental Car facility (CONRAC). Travelers will use the current entrance point for Long Term A and Short Term Parking, but they will now have separate ticket dispensers and toll plazas. Signs will direct visitors to the entry and exit points for Long Term A and Short Term Parking. Long Term A will exit to Terminal Drive through a new intersection. The Short Term Parking exit point to Terminal Drive will not change. 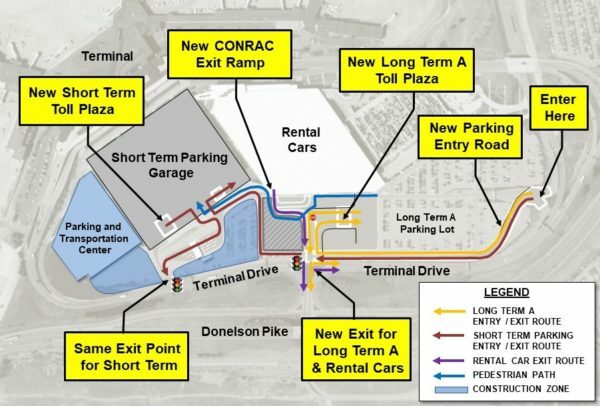 Rental cars will exit CONRAC, the airport’s Consolidated Rental Car facility, via new exit ramps and the new intersection at Terminal Drive. The pedestrian path from Long Term A to the terminal will change. Please refer to the map. Courtesy shuttles will still provide transit to/from Long Term A and the terminal. These changes do not affect Long Term B, Economy, Valet or BNA Express Park. Travelers may call 615-275-1045 for more information about parking changes, which are part of BNA Vision, the dynamic growth and expansion plan for Nashville International Airport.